MELBOURNE • A 170-run stand between century-maker Cheteshwar Pujara and captain Virat Kohli put India in a dominant position in the third Test yesterday as Australia's openers survived half a dozen nervy overs before the close. Pujara stroked 106 and Kohli, 82, before they both fell soon after lunch on what until then had been a lifeless Melbourne pitch. Rohit Sharma was 63 not out after notching his 10th Test half-century when Kohli called a halt to the innings late in the day at 443 for seven as India go in search of a 2-1 lead in the four-Test series. It allowed their attack six overs before stumps to target the hosts' openers Marcus Harris and Aaron Finch, who battled through to be eight without loss. "We have enough runs on the board," said Pujara. "Already, you can see the pitch has started deteriorating and there's variable bounce on it. I don't think it's easy to bat now. "Our bowlers have been bowling well so I would say we have enough runs on the board." Despite the ominous task ahead with an Australian batting order still finding its feet, Finch insisted victory is still within reach. "It's still game on if we bat really well, and then back up and bowl well, and put India under a lot of pressure," he said. "Absolutely, all three results are still on the table 100 per cent - India, Australia and a draw. "It's hard to say after two days with the wicket deteriorating, but we are confident we can bat really big." 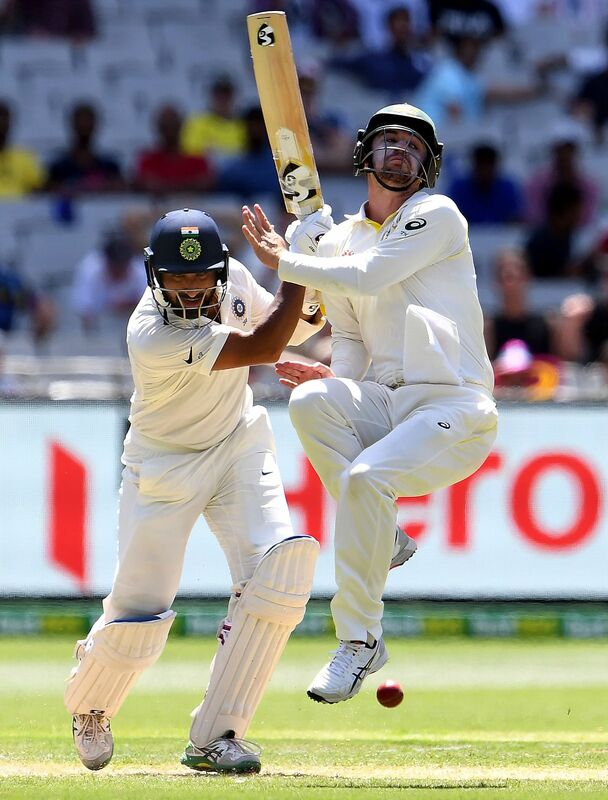 Kohli was undone by pace spearhead Mitchell Starc after he started to take on the short ball soon after being seen by the physiotherapist for a back issue in the afternoon. Although he was deprived of a 26th Test century and the chance to surpass boyhood hero Sachin Tendulkar by making a seventh hundred in Australia, he was as unflappable as Pujara. The 30-year-old, who has scored more runs and faced more balls than any other batsman in the series, added 38 to his overnight 68. It was another impressive knock by a man who has now scored 17 Test tons and two in this series. India won the opening clash in Adelaide by 31 runs and Australia drew level with a 146-run victory in Perth. The finale is in Sydney.